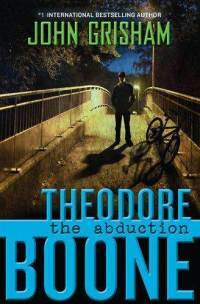 The story starts off with Theodore, the main character finding out that his best friend April Finnemore has been kidnapped in the middle of the night. Meanwhile, a prison escapee is seen in the area, and the detectives find out that Jack Leeper is a distant cousin to April, and her pen pal as well. Theo is the only one that knows that April was alone in her house when she was kidnapped, and she made him promise not to tell anyone. Soon, everyone in the small town of Strattenburg is either praying or in the streets looking for April. Days pass by and there is no sign of the missing girl, until the police retrieve a dead body from the river. There are many people who believe that April is dead, but not Theo. He and his friends set out on search parties to look for their lost friend, but they come back empty handed. When Theo’s uncle Ike calls him over to his office, Theo is relieved to know that the police determined the dead body is not April. Later that week, Theo’s parents need to go to a conference, and they do not want to leave Theo home alone. It is decided that he will stay at his friend’s house. There, the two boys search online for April’s location. When they finally spot her in photos at a college nearly 7 hours away, Ike and Theo set out immediately to retrieve her, and soon bring her back. This book was a very interesting read by John Grisham, the sequel to Theodore Boone: Kid Lawyer. It was slightly simpler to read than its prequel, and contained less complicated language and legal terms. The book encouraged the importance of keeping promises and being loyal to friends, and it was seen that Theo was a very good example of a wonderful friend. The story was very gripping, and Grisham kept my interest at all times. The amount of suspense was immense, as I kept flipping the pages in order to find out what had happened to April. The author included several ideas that may have led to what April was going through, and I enjoyed trying to figure out who was the culprit myself. Although I am happy that it was a positive ending, I felt it was a bit anti-climatic. I was expecting a dangerous villain of some sort to have taken April, but that was not true, and I feel the book could have had a better resolution. I would say that this book is good for 7th-9th graders who like mysteries and thrilling books. In the end, I would give this book nine out of ten stars. 2. Why does Officer Bard react to finding out Theo’s parents’ names? 3. After reading chapter 5, what type of a dog is Judge? 4. Who were the two people in ‘the bridge’ who saw Jack Leeper? 5. Who does Elsa think the dead body was, and why does Theo contradict her? 6. In what grade does April come back to Strattenburg, and what does she say to Theo? 7. Why did Theo sit out with April during P.E? 8. Who does Theo call for an update about April during the game? 9. Why does Theo think Ike has, “slow mornings,”? 10. Who does Theo impersonate and be like when presenting a case? 11. What does Theo think should be done with Pete? 12. Why do Theo’s parents refuse to let him stay home alone? 13. Why does Ike think Theo is the best person to go and get April? 14. Why do Ike and Theo lie about their identities to Zack? 15. Who is appointed as April’s temporary guardian and why?